I was excited when this book arrived just as my students developed an interest in exploring whether sink or float! It’s great to have a fun story to connect with this popular topic that comes up every year in my kindergarten classroom. I’m also thrilled to share this book because Debbie Ridpath Ohi is one of my writing buddies. 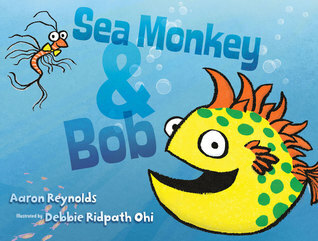 Sea Monkey & Bob was written and illustrated by Aaron Reynolds and illustrated by Debbie Ridpath Ohi. It was published in 2017 by Simon & Schuster. This is a good example of a story told through a conversation between two characters. The design of using different fonts in different colours right from the first page makes it easy for a reader to use a different voice for each character. The text and illustrations worked together well to tell a fun story about sinking and floating, but there was another level of story about fears and how friends can help you when you feel afraid. I read this book to my kindergarten students a few times during our exploration of sinking and floating. I really liked how some of the materials included in the story were items we could actually test (e.g., feathers, tennis balls). The theme of how a friend can help you through a scary moment provides a good opportunity for a discussion about ways to cope when you feel scared. 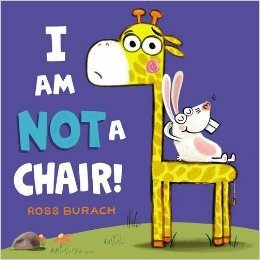 With the big, bold illustration style, even the kids in the back of the group could see what was happening during a read aloud. The style of bright colours with a dark line around the outside would be fun to use as a model for creating under-the-sea art. Do all heavy things sink? Do all light things float? Collect some different materials and experiment to find out! Make a chart to show your results. Take on a boat-making challenge: Can you make a boat to hold something that might normally sink? Draw a picture of a time you felt afraid. Do you have a favourite friend or stuffed toy to help you feel less alone? Add your friend to the picture! What is your favourite sea animal? Create a drawing using the style of bright colours with a dark outline. What do you think your animal might be afraid of?